The present case has been reported in the Journal of Medical Case Reports. A 33-year-old married woman presented with an episode of sudden onset of dark-colored urine with the background history of self-ingestion of 15 mothballs 2 days prior. This was an impulsive attempt after a quarrel with her husband. She denied co-ingestion of other substances including pharmaceuticals. There was no significant complaint other than malaise and mild epigastric pain. She did not have features suggestive of urinary tract infection. Her past medical history, including history of hereditary hemolytic anemias, was unremarkable. She was not on any routine medications. Examination revealed severe pallor with lemon tinge icterus. Abdominal examination was normal, and other systemic examination was unremarkable. Her clinical test revealed severe normochromic normocytic anemia with a hemoglobin level of 5.9 g/dL and a reticulocyte index of 2.36 with indirect hyperbilirubinemia. 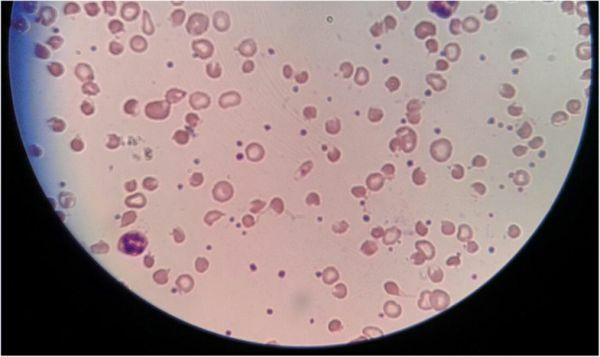 Her blood picture featured normochromic normocytic red cells with reduced count, blister cells, bite cells, and red cell fragments suggestive of intravascular hemolysis. She was hydrated adequately with monitoring of urinary output as well as serum creatinine. During hospital stay, she was transfused with two packs of red cell concentrate. Over a week, the hemoglobin levels increased and hemolysis settled. She never went into acute kidney injury. A review after 4 weeks revealed a hemoglobin level of 12.1 g/dL and she was symptom free.